One of the outstanding colonial Royal Governors of North Carolina who is seldom associated with Bertie County, but who lived, died and was buried in said county, was Governor Gabriel Johnston. He was the second Royal Governor, being appointed in 1733 to succeed Governor George Burrington. He first touched the shores of North Carolina near the mouth of the Cape Fear River, where at Brusnwick, on November 2, 1734, he took upon himself the authority of his office. The Johnstons were of an ancient family and derived their name from the Barony of Johnston in Annandale, Scotland. The family, whose records date far back into the 10th century, have contributed much to the history of Scotland. Governor Gabriel Johnston was the son of Sir John Johnston of Stapelton. He was educated at the University of St. Andrew and after a few years studying medicine he was appointed professor of Oriental languages in the University, but later went to London where he entered politics. There he wrote for the columns of The Craftsman, a journal opposed to the ministry. He thus became associated with men like Bolingbroke, Pulteney, and others who lavished upon London so much wit and ridicule of the Hanoverians. From 1726, until he left for North Carolina, among the closest friends of Gabriel Johnston in London were his relatives William Johnston, later Earl of Bath and spencer Compton, Earl of Wilmington. In 1740, Governor Gabriel Johnston, as a compliment to his patron, Spencer Compton, changed the name of the little town of Newton on the Cape Fear River to Wilmington. Though some Scots families were already settled along the Cape Fear River, it was during Johnston's long administration that the Scots emigration began to increase at a very rapid rate, due greatly to the Governor's effort and encouragement. In 1735, Governor Johnston traveled from the Cape Fear region to Edenton, "with his equipage and family," and by 1737, was occupying his own plantation on Salmon Creek in Bertie County. Thus he had come to the seat of many of the colony's earlier governors, such as Sothel, Pollock, Hyde, and Eden. From all accounts it would seem that Governor Johnston was married when he arrived in Bertie County to take up residence. However, it is known that he had two natural children, Henry, who died in 1772, and Carolina, who was probably demented or at least weak-minded. It may be that these constituted "the family" referred to when he came to the northern part of the province. When Governor Johnston began his administration he found the inhabitants of North Carolina in a turmoil concerning the issue of quit-rents. Under the Lords Proprietors, what quit-rents that had been collected were done so at a valuatation established by a Legislative Act of 1715. For years this rent had been payable on the farms and in commodities. When the Crown bought the colony from the Lords Proprietors in 1729, attempts through its first Royal Governor George Burrington were made to change this. Now these quit-rents had to be paid in proclamation money and all land holders with the amounts of their acres had to be registered so as to provide a rent roll for the Crown. Governor Johnston upheld his predecessor and the Crown in this controversy and also insisted that the king had the right to fix the place of collection. All of this was, of course, stiffly opposed by the House of Burgesses and the inhabitants were urging one another not to pay these rents. When it was reported, (falsely, however,) that a man in Edenton had been jailed for refusing to pay his quit-rents, 500 men in Bertie and Edgecombe Counties rose in arms and set out to rescue him by force, "cursing his Majesty and uttering a great many rebellious speeches." During the next several years controversy continued between Governor Johnston and the House of Burgesses. At this time, William Downing of Bertie was presiding as Speaker of the House. Finally in 1739, a compromise was reached and a quit-rent Act was passed satsifactory to both factions, only to be disallowed by the Crown, because it gave to a provincial group the power to regulate the value of the currency. Further attempts to pass quit-rent laws failed until 1748 when the House of Burgesses and Governor Johnston again found themselves able to compromise on these laws. Throughout Governor Johnston's administration these quit-rent laws continued to be a headache. Their enforcement was never anything but lax as is evident, when at the death of Governor Johnston, he had received no salary for the proceeding twelve years because the quit-rents collected, from which his salary was obtained, had not been sufficient to pay it. Another reason the treasury was so depleted is that in 1744 the unsold Lord Proprietor's share belonging to the Earl of Granville, was actually laid off, and survey and all the quit-rents collected in this territory, which included most of the northern part of the colony, went into private hands rather than to the provincial government. With the northern counties lying in the Granville District, the people there, naturally had interest different from these inhabitants outside the district, dwelling in the lower part of the province. This lower section of the province around the Cape Fear River was growing and developing rapidly, and the friction between it and the northern counties was beginning to mount. This ill feeling involved the location of the seat of the colonial government. Until this time, most of the House of Burgesses had convened in and about Edenton. The inhabitants of the southern counties thought that it was unreasonable that they should have to travel so far to transact public business and preferred that the so-called capital be moved to New Bern, which was a more central location. Governor Johnston was in favor of this change and also of equalizing representation among the counties. Until then, the Albemarle region had had control of the House of Burgesses from a numerical standpoint. To aid the southern counties in their effort for equalization of power, Governor Johnston called several of the House of Burgesses to convene in Wilmington. As a result, the Albemarle counties refused to participate in the provincial government and refused to send delegates to the Assemblies. It was evident from the beginning of Governor Johnston's administration that his sympathies were with the Scots settlers of the Cape Fear region. After all, he was responsible for a great number of them being there. In fact he bought property in this vicinty and it is supposed that it was his intention to later make his home there, until his official business brought him to the Albemarle region, where he fell under the charms of the often-widowed heiress of "Eden House." By her marriage to William Maule, Penelope Galland was the mother of Penelope Maule, who became the first wife of Dr. William Cathcart. The will of William Maule speaks of his property which included Mount Galland (named in honor of his wife) and the plantation Scots Hall. Mount Galland, situated on the Chowan River is known today as Mount Gould. After his marriage to Penelope Galland, Governor Johnston took up residence at "Eden House." There to him and his often-married wife was born a daughter, Penelope Johnston. In spite of the political conflict existing between the two sections of the colony, in 1740, when England went to war with Spain, Governor Gabriel Johnston was able to raise companies of men in both the Albemarle region and along the Cape Fear that served in the expedition against Cartagena in Columbia, South America. Again, in 1744, hostilities broke out between England and France. In view of this fact when the House of Burgesses met that year, attention was given to the defense of the seacoast, which had in the past been ravaged by Spanish cruisers. As a result, a fort was constructed at the mouth of the Cape Fear River and named Fort Johnston in honor of the governor. When Penelope Galland Maule Lovick Phenney Johnston died, Governor Johnston married again in 1751 a widow, Frances Button. The following year, July 17, 1752, Governor Gabriel Johnston died at his seat "Eden House" and was buried there. The exact location of his grave is not now known. In his will, the Governor begs of his "Dearest wife" to be a kind mother to his "dear little girl." He left his daughter considerable land and slaves, but did not include her among those who had a share in the residuary estate. On the death of her half brother, Henry Johnston, in 1772, she fell heir to his fifth of that estate. She was many years, however, attempting to secure her portion. She married Colonel John Dawson, a Virginia lawyer, who came to reside at "Eden House." Their son, William Johnston Dawson, became a member of U.S. House of Representatives, and was one of the commissioners to select the site and prepare the plan of the city of Raleigh, giving his name to one of the streets. The governor's daughter, Penelope Johnston, was still living as the Widow Dawson in 1798, the year Congressman Dawson died. After Governor Gabriel Johnston's death in 1752, his widow, Frances married John Rutherfurd of New Hanover County. Rutherfurd was in charge of settling the estate and was many years closing it up. There was much controversy and litigation involved and it is well known that he did not perform his task to the satisfaction of the Johnston family. Among the manuscripts in the possession of the North Carolina Historical Commissiion is an "account of John Rutherfurd and Frances, his wife with the estate of Governor Gabriel Johnston," which covers the years 1752 to 1756. Its later pages contain accounts of money disbursed for such Bertie plantations as "Eden House" and "Mount Galland." It also contains items regarding Henry Johnston, Caroline, his sister, and Penelope (education at Williamsburg - 83 pounds, 16 shillings and 6 pence). One of the questions involved in the settlement of the estate was the distribution of the arrears of Governor Johnston's salary, which was not effected for nearly 50 years. At the governor's death, the British Government owed his estate more than £12,000 in arrears of salary. His widow, Frances, put in a claim for this amount and her second husband, John Rutherfurd, finally went to England where, in 1761, he obtained a royal warrant authorizing the payment. The quit-rents collected in North Carolina were not sufficient for the purpose, however, so the warrant was addressed to the Receiver General of South Carolina, instructing him to pay the entire amount from the quti-rents of that Province. As late as 1767, Rutherfurd was still trying to obtain through, Henry Laurens, attorney for the estate, payment of the sum authorized by the British Treasury. He, finally, before his death, obtained most of the £12,000. Rutherford, however, appropriated for his own use much more than he was legally entitled to keep. Though Governor Gabriel Johnston had had difficulty with his legislature, much progress had been made during his administration in the North Carolina province. Useful Acts had been passed regulating marriage, the rate of interest, damage on foreign bills, roads and navigation, trial of small cases, regulation of taverns, and for the betterment of prisoners. Laws regarding the morals and religion of the people were also passed. One Act provided that each person should on Sunday carefully apply himself to the duties of religion. All work and amusements were forbidden on a penalty of 14 shillings. Unmarried mothers were committed to jail until disclosing the paternity of the child. It was also a statute that it was the duty of clergymen, lay readers, and others to read these laws in all churches, chapels, and places of religious worship. The North Carolina exports of 1752 were 61,528 barrels of tar; 12,055 of pitch; 10,429 of turpentine; 762,000 staves; 61,580 bushels of corn; 100 hogsheads of tobacco. During the eighteen years of Governor Johnston's rule, the colony had nearly tripled its population (due mostly to the immigration of the Scots-Irish and Germans) Among the new counties that had come into being during this time were Bladen, Edgecombe, Anson, Granville, Orange, and Johnston (named in honor of the Governor). In 1741, Northampton had been carved out of Bertie. It is recorded, that at this period, the inhabitants of Bertie County had become more numerous than any other county in the province. The line of the new county ran five miles west of the courthouse of Bertie County, then located at St. John's. Statutes provided that a new courthouse, jail, and stocks for Bertie County should be erected on Will's Quarter Branch, near the present county seat of Windsor. Also, at the end of Governor Johnston's administration the Piedmont section was just beginning to open up and the province of North Carolina was awakening to an era of opportunity and advancement. When Gabriel Johnston was appointed Governor in 1734 he re-assessed the militia and in 1735 introduced legislation to "put the militia on better footing." In 1740, a new and only slightly modified version of the 1715 act was passed. A new piece of legislation, the Militia Act of 1746, placed servants as well as freemen on the militia rolls. Millers and ferrymen were added to the exemption list. There were to be at least two types of militia musters. The regiment was to muster annually and the companies were to muster four times a year. One drew militiamen to their local companies, while the second muster was general. The law allowed the militia to act in concert with the militias of Virginia and South Carolina, but no other province. The new law also made provision for mounted troops. The act also allowed the governor to call out the militia to march to the assistance of either Virginia or South Carolina, provided that these colonies should bear the costs of such assistance. Many militiamen resisted this provision, arguing that it was, or at least should be, unlawful to deploy the militia outside the colony. In 1749, the militia law was again changed since the 1746 Act was given only a three year life. Company musters were reduced in number to two per year. The death penalty was no longer permitted in court martial cases. Gabriel Johnston, a Lowland Scot, served as Royal Governor of North Carolina from 1734-1752. He wrote many enthusiastic letters to friends in Scotland inviting them to come to a land where there were two crops each year, free land grants and possible exemption from taxation. 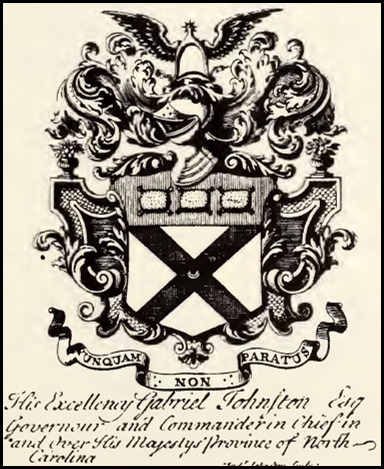 Gabriel Johnston, Royal Governor of North Carolina, was born in Scotland in 1699 and he died in Chowan County, North Carolina, in August of 1752. He was educated at the University of St. Andrews, Scotland, and studied medicine, but is supposed not to have practised. For several years he was professor of oriental languages at St. Andrews. Removing to London, he became distinguished as a man of letters and liberal views, and was engaged with Lord Henry Bolingbroke in writing for the "Craftsman," a political and literary magazine. Emigrating to North Carolina about 1735 and settling there, through the influence of the Earl of Wilmington, he was appointed governor of that colony. His administration was successful, the province greatly increased in wealth, population, and general prosperity under his rule, which continued from his appointment till his death. Although normally profitable, the production of naval stores could be less appealing when the price declined. As Royal Governor Gabriel Johnston observed in 1734: "There is more pitch and tarr made in the two Carolinas than in all the other provinces on the Continent and rather more in this than in South Carolina but their two Commodities (tarr especially) bear so low a price in London (1,000 Barrels scarce clearing 20s sterling) that I find the Planters are generally resolved to make no more." Governor Gabriel Johnston purchased land adjacent to the Newton boundary shortly after he took office, and he decreed in 1735 that quit-rents would be paid in Newton, not Brunswick Town (New Hanover County Seat at that time). The orders Governor Johnston issued were made in preparation for a bill which was introduced into the North Carolina General Assembly in 1736: "for establishing and confirming a Town in New Hanover Precinct by the name of Wilmington at a place now called Newton." This bill did not pass, but its failure did not dissuade the people of Newton, nor the Governor, from continuing efforts to incorporate the town and build its prestige. The North Carolina Assembly legislated in 1739 on what appeared to be an unrelated matter, but the town of Newton was prepared for the results of their new legislation. The North Carolina General Assembly Act of 1739 proved to be ultimate downfall of Brunswick Town. One of the main purposes for the Court of Oyer and Terminer in the province was to prevent long pre-trial imprisonment in outlying areas. The concept was only effective if the court could be convened in a convenient location for the parties involved and then held with a reasonably frequent schedule. The court had never met in the southern part of North Carolina and Governor Johnston's efforts to increase the frequency of court sessions had not alleviated this judicial problem entirely. This Act created a circuit court from the Court of Oyer and Terminer. Three districts were created in North Carolina and the southern district was created with New Hanover, Bladen, and Onslow counties. This court convened each May and September. The citizens of the town of Newton knew it was vitally important to participate in the growth of the town. They therefore decided to take up a voluntary contribution toward the construction of a court house for this newly created circuit court. This proved to be an important decision in the path of the town's future. Construction on the court house was nearly completed in 1739. November 11, 1739 was a watershed day for Newton and Brunswick Town as a petition was sent to the General Assembly holding that Newton was the most convenient location for the county seat and that great savings would be shared by the state to convene all government business in the courthouse there. The folks of Brunswick Town attempted to rally with the levying of a tax for the funding of a court house and a jail, but the effort was too late to counteract what took place on February 25, 1740. The petition for the county seat was heard before the House of Burgesses as they convened in New Bern and they passed this petition as well as what would be known as the Wilmington Act, giving Newton its incorporation and a new name. Wilmington was given its name in honor of Spencer Compton, Earl of Wilmington, who would later become the Prime Minister of England. The fight within the House of Burgesses was tough, as many of the landowners from Brunswick held seats in the legislature. There was a time during the course of debate where those against incorporation for Newton and in support of the maintenance of Brunswick as the county seat would prevail with political maneuvering. However, Governor Johnston was prepared and he eventually got what he wanted, defeating "the Family" for the final victory of Wilmington over Brunswick Town. As the importance of Newton grew with the courts, the customs house and the naval officer for the Port of Brunswick moving offices into the new court house and surrounding buildings, the prestige of Brunswick Town began to fade rapidly. Throughout the colonial period the bitterness between the two towns continued until Brunswick Town was eventually abandoned after its destruction by British troops during the Revolutionary War. Newton, now Wilmington, continued to flourish after its incorporation in 1740. Wilmington grew to be the largest city in North Carolina prior to the Civil War and was a vital Confederate port, the last to fall to Union troops. In the present day it is a city of history and culture that continues to flourish - thanks to Governor Gabriel Johnston. John Smith was born about 1700 in Knapdale, Argyll, Scotland. He immigrated in 1739 to New Hanover County, North Carolina. He landed in the Port of Brunswick in September 1739 on the Thistle with approximately 350 other Scottish Immigrants. They had sailed in July from Campbeltown, Argyll, Scotland following a recommendation of a committee of leading citizens. An advance trip, encouraged by Governor Gabriel Johnston, also a Scot, had occurred in 1736. Free land grants and exemption from taxation for a set time period were the incentives that were designed to counter the dismantling of the tacksmen system and a depression in cattle prices in Scotland. In 1739, the colonial capital of North Carolina was moved to Newton by the Royal Governor, Gabriel Johnston. He renamed Newton (or New Town as it was also called) to Wilmington for Spencer Compton, the Earl of Wilmington, in England. Gabriel Johnston, a North Carolina Royal Governor and a Scot, offered low land prices and persuaded the legislature to exempt the Scots from taxes until they became established. On March 27, 1732/33, the Crown appointed Gabriel Johnston as the next governor of North Carolina and ordered that a draft commission and draft instructions be prepared. On April 5, 1733, the Board of Trade issued a draft commission and draft instructions to the Crown for its approval. On May 10, 1733, the Crown approved the commission and instructions for Gov. Gabriel Johnston and it directed the Board of Trade to prepare a warrant for the King's signature. On July 18, 1733, the Board of Trade sent the instructions to the Duke of Newcastle - and these are allegedly identical to those earlier given to George Burrington, however, with a few new Councillors named. On August 2, 1733, the Crown approved the instructions to be given to Gov. Gabriel Johnston. Click Here for information on the Executive Council under Governor Gabriel Johnston.